• A generic decision model of refueling policies: a case study of a Brazilian motor carrier, by Amilton Dias Rodrigues Junior*, Marta Monteiro da Costa Cruz [paper in English]. • Suitability of Brazilian ports to international standards of port needs: a case study in the port of Salvador, by Cristiane Ferreira da Silva Barros*, Cleyton Miranda Barros [paper in English]. • The effect of social stigma on fare evasion in Stockholm's public transport, by Adeline Sterner, Shu Sheng* [paper in English]. • Performance evaluation of ports using data envelopment analysis: a case study on the ports of Northeast region of Brazil, by José Nauri Cazuza de Sousa Júnior, Ernesto Ferreira Nobre Júnior, Bruno de Athayde Prata*, João Carlos Correia Baptista Soares de Mello [paper in Portuguese]. • Estimating travel time value by different data source using the logit model, by Francisco Gildemir Ferreira da Silva*, Sergio Aquino DeSouza [paper in Portuguese]. • Analysis of airport choice modeling in multi-airport regions, by Mayara Condé Rocha Murça*, Anderson Ribeiro Correia [paper in Portuguese]. • Technical efficiency: an evaluation of Brazilian airports, by Arthur Moura Neto* [paper in Portuguese]. • Analysis of key metrics used in sound zoning around of areas close to aerodromes, by Edson Benício de Carvalho Júnior*, Sérgio Luiz Garavelli, Felipe Vivian Smozinski, Armando de Mendonça Maroja, Wesley Candido de Melo [paper in Portuguese]. • The Growth Acceleration Program (PAC)’s investments in transportation and the Brazilian multiplication effect since Lula da Silva’s government, by Márcio Rogério Silveira, Alessandra dos Santos Julio* [paper in Portuguese]. 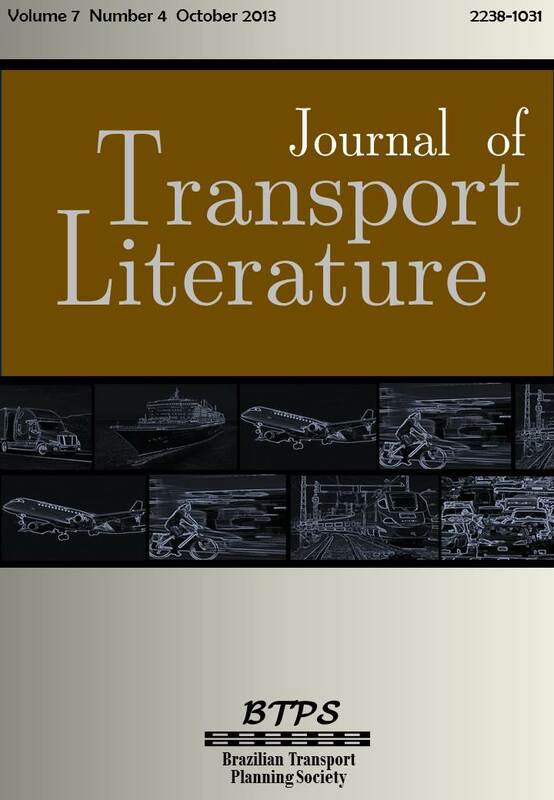 • Urban sprawl and travel patterns modeling with structural equations, by Ronny Marcelo Aliaga Medrano*, Pastor Willy Gonzales Taco [paper in Portuguese].